Climb into the cockpit of the Race Car, with its large rear engine, side air intakes, wide rims with low profile tires and a sporty blue, white, yellow and black color scheme. Adjust the wing mirrors and rear spoiler for maximum speed. Then take your position at the starting line and get ready to race! When you're done, rebuild the Race Car and take to the track in a powerful Hot Rod or thunder over the waves in a cool, race-winning Speedboat. 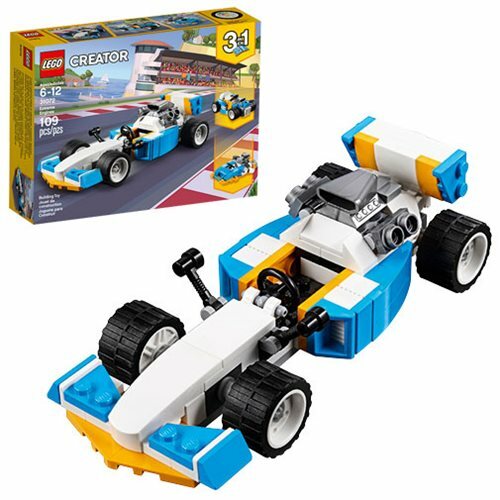 The LEGO Creator 31072 Extreme Engines includes 109 pieces. Ages 6 and up.